During a recent ride I noticed my Bottom Bracket was cooked. A good ol' Shimano UN-73. This is the first time a bottom bracket dies on me like that. At least It took me to Ukiah, CA (another ~50 miles away) and then the next morning another ~50 miles of very gentle riding to Healdsburg where I was picked by the wife. 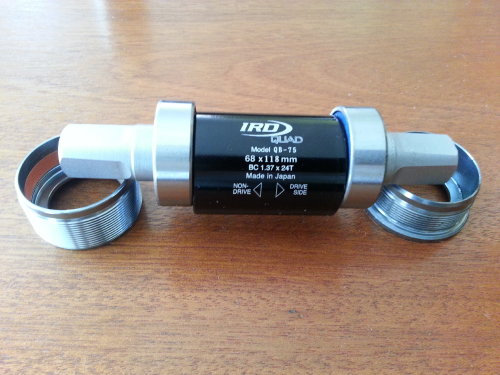 I replaced my broken Bottom Bracket with an IRD QB-75. 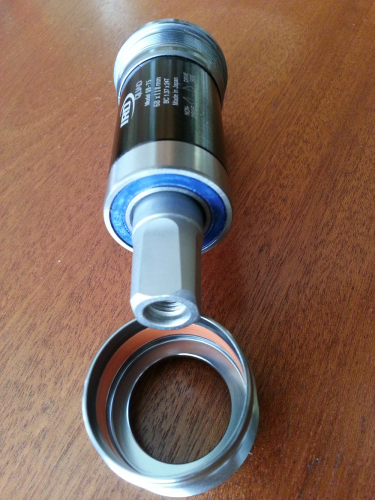 I liked the fact that it is a "cartridge" design but has sealed bearings you can access and potentially lubricate by carefully lifting the seals with a needle and replacing them back after injecting grease. That is what I did when I was using my old Mantis Flying V and Klein Attitude frames, both used pressed-in bottom brackets and never had an issue with that lubricating method. The sealed bearings read Tange Seiki on raised letters and IRD website confirms they are mde by Tange Seiki. I abuse my bottom bracket a lot. Riding brevets on the rain and many mixed terrain rides on very questionable weather. I'll try to remember to update this post after I have some significant use out if it. My average yearly mileage is about 5000 miles, probably 3500-4000 for that bike. The Shimano lasted me maybe 4 years... I think. Construction seems very good but only time will tell.